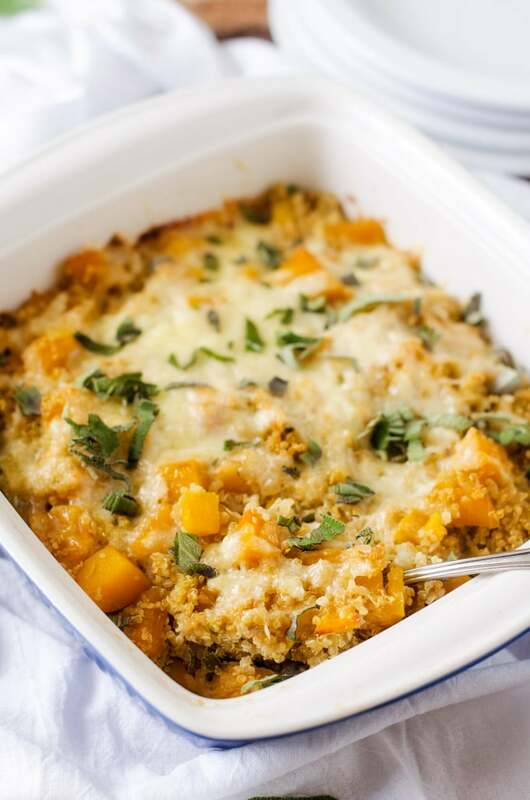 This butternut squash quinoa casserole will blow your mind away! Healthy and delicious, this is a quinoa casserole the whole family will love. Eating with the seasons is a good thing. But some foods I avoid in the summer and then when September rolls around I wonder why I stayed away. Butternut Squash is one of them. 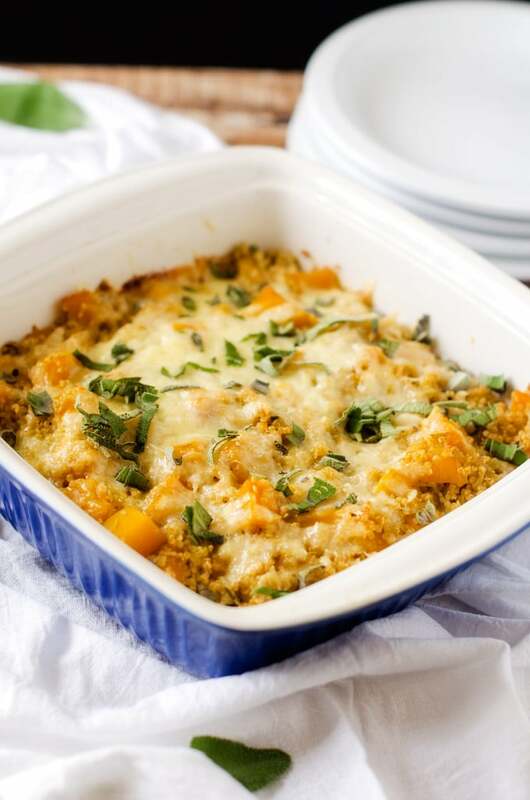 Today’s Butternut Squash Quinoa Casserole is my favorite kind of vegetarian main dish. It takes butternut squash casserole to a whole new level! Preheat oven to 350 degrees. Spray a large baking sheet with olive oil. Add squash and sprinkle with salt and pepper. Roast for 15 minutes. Heat olive oil over medium heat. Add shallots and sage and cook for 8 minutes or until shallots are tender. Add in garlic and cook for another 30 seconds. Add in quinoa and squash and stir for another minute. Add in broth, black pepper, sea salt and cayenne pepper. Bring to a simmer and then reduce the heat to low. Cover and cook for 25 minutes or until most of the liquid is absorbed. Move the quinoa mixture to an oven safe pan. In a small bowl, combine milk and eggs and pour over the quinoa mixture. Top with cheese. Bake at 350 degrees for 30 minutes. If desired, broil for two minutes to brown the top. This makes a great side dish or vegetarian main course. To make this vegan, omit the eggs and add in an additional 1/4 cup of nut milk. If you would prefer to skip the vegan cheese, breadcrumbs work great here too. 0 Response to "BUTTERNUT SQUASH QUINOA CASSEROLE"